Project management :.NET interview questions - How you will explain ROI? This is a typical management type .NET interview questions asked by the interviewer to test the candidate's skill on management. ROI is a measurement by which we can evaluate the financial value organization will gain from the project. ROI can also be used to measure returns from IT department to a company. In this book we will see ROI from the project perspective. In one line ROI compares how much cost you will be incurring on the project to the total profit you will get out of the project. Let's take a simple example of a software company who is developing a simple software accounting application. The following is a rough spending and forecast revenue on the accounting application year wise. 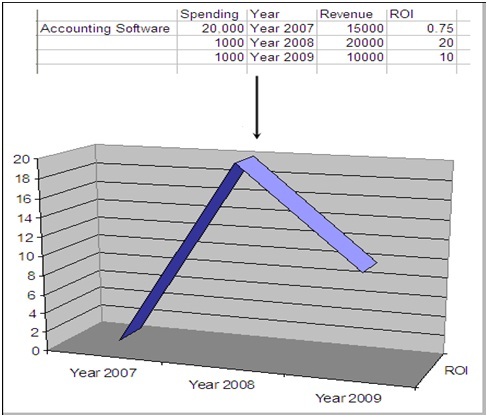 Year 2007:- In this year they will built the accounting application. Total rough estimate is 20,000 Dollars. They will be selling per installation of the accounting software for 1500 dollars. Company estimates that only 10 installation of the accounting software will happen in the first year. 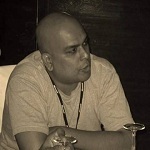 Year 2008:- In the next year i.e. 2008 we need to only spend 1000$ on the traveling charges of the installation engineer. In this year they expect 13 to 15 installations. So forecasting from minimum sales we assume that only 13 installations will happen, i.e. a net profit of approximately 20,000 dollars. Year 2009:- From year 2009 onwards company expects to have fixed installation of 5 to 6 because of competitors coming in. So the net profit is around 10,000 dollars. Below figure ‘ROI' shows how the ROI calculation with respect to the yearly view. In the below figure you can see we have the statistics and a graph drawn from the statistics. The ROI increases till 20 in 2008 and then again comes down to 10 in 2009.